Do not practise agnisar kriya with a full stomach. Wait until three or four hours have elapsed after a meal. The best time to practise is early in the morning before breakfast, preferably after going to the toilet. However, if you wish you can do this practice before going to the toilet to help induce a good bowel movement. possible functioning of these organs. It promotes the correct secretion of digestive juices and thereby allows optimum assimilation of nutrients from the food that we eat. Furthermore, it prevents and removes various digestive maladies such as constipation, indigestion, hyperacidity, hypoacidity, flatulence and sluggishness of the liver, etc. If a person has strong and efficient internal organs, he is far more able to avoid disease. Moreover, even if he mistreats his body the organs are easily able to cope with the situation and bring the body back into balance. 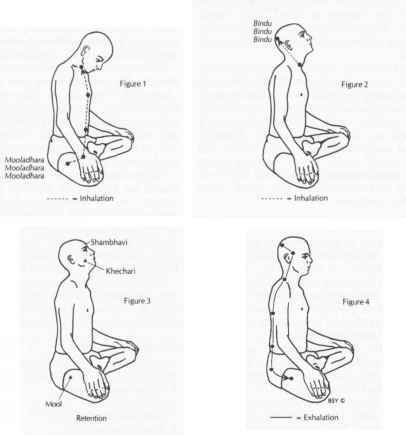 Agnisar kriya strengthens the organs that lie in the lower part of the trunk. In this way it helps the individual to withstand the onslaught of disease and the general unhealthy conditions of everyday life. This is an important practice and we recommend everyone to try it on a regular basis.